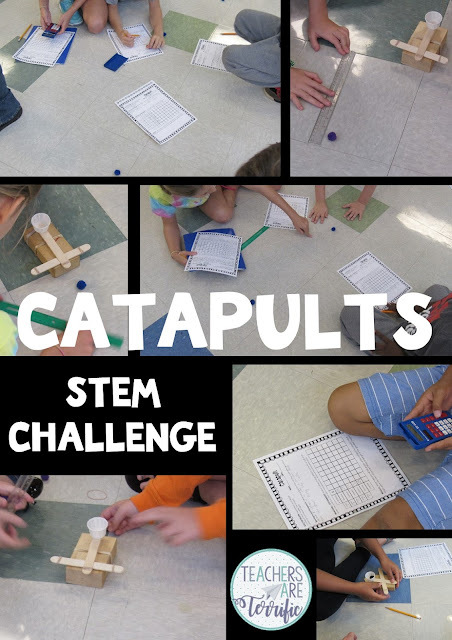 This is one of the first STEM Challenges I ever tried and I knew kids loved it. After building the catapults and just testing them one year I decided the next year to add a little bit more zing to it! Okay, well, epic fail on my part. I forgot that when kids are free to invent they really do...with extreme measures. We use a t-shaped device. The vertical craft sticks above open up so that we can insert a set of craft sticks in the horizontal position. 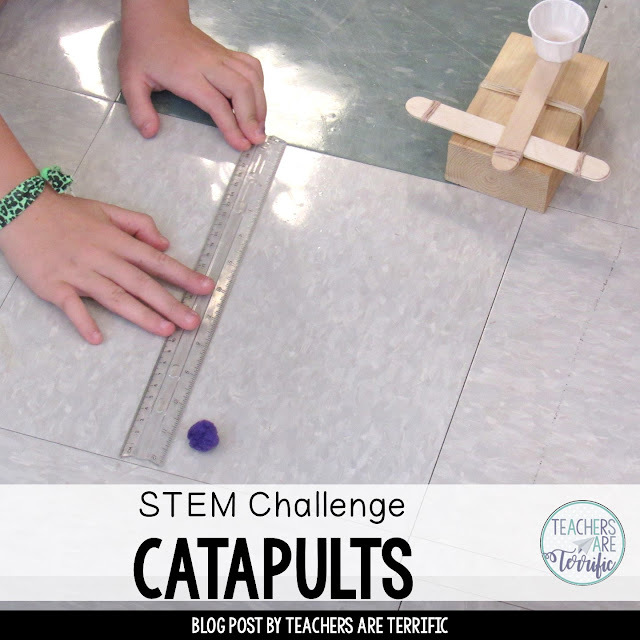 The more sticks you place in the opening the higher the angle of the catapult. I always have the kids start off with 2 craft sticks in the cross beam. Now, with my idea for letting kids experiment they were able to decide how many sticks to try next. I mean, if two sticks work pretty well, then ten should work extremely well. Uh, not so much. So, I went back to the drawing board and created a very detailed and efficient method of experimenting with the craft sticks. The newly revised edition of our challenge involved testing two craft sticks and doing five launches. Then the kids average those distances. Oh, my. We have a huge data table to record the distances. (More about that later.) And the kids use calculators to average. We measure in inches and round up to the nearest inch when measuring. This is my favorite part of STEM. Just look at the kids in the above photo. Everyone has a job and they are all engaged in the event, and loving it. You have one student jotting down distances, another totaling those distances, and a third is the catapult launcher. They all help measure. I learned a long time ago to simplify measuring in the lab. We use our 12-inch floor tiles. The kids just count them and multiply by 12 and then actually measure the extra distance and add to the total. After the groups are finished with all the testing they use their data. Which amount of craft sticks in the catapult gave them the greatest distance? They create a catapult built with that number of craft sticks and compete. Our launching line is in the photo above. This is very exciting as they all line up ready to launch. There are actually three different competitions we use in this challenge and I can say this: It's the noisiest time of our STEM Class. Everyone cheers when launches are made and a team loses by a small margin or misses a target or hits a target. It is so much fun!